KSTP-TV is an ABC-affiliate serving Minneapolis and St. Paul. Our news program, 5 Eyewitness News, covers local events and breaking news in the area. Like most local news stations, we do a lot of live shots, and we’re regularly sending our news crew into the field to cover news as it happens. We’ve been using a traditional IFB system, in which our truck calls into an IFB number and transmits the feed to our IFB receivers. But recently, we’ve run into problems while doing larger remotes, where we’ve had more people in the field than we have receivers. We’ve had no way for everyone on the team to monitor IFB, meaning that sometimes, people are left out of the loop (as it were). We wanted a way to have multiple people dial into the same IFB source from their phone, so that all the members of our team can share a common IFB. EarShot IFB appealed to us because it can handle up to 30 standard telephone calls, or 10 wideband calls, meaning that up to 30 users could call in and listen to a single IFB feed. It has the ability to eliminate the need for IFB receivers and truck-generated IFB. EarShot IFB can let us access the IFB from our phones, which streamlines our process in the field. We’ve been using EarShot IFB for the last several months. 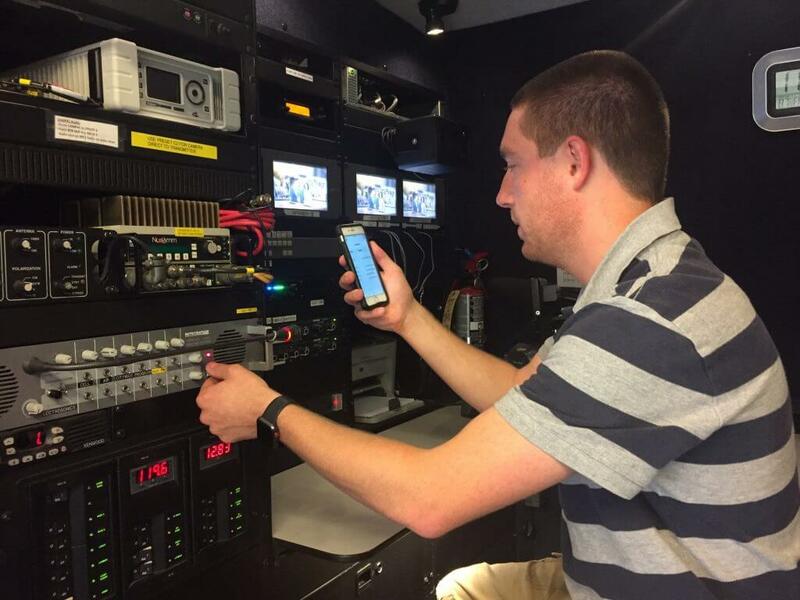 We’ve had it set up in a more traditional way, with IFB receivers and a truck-generated feed. But I’ve been using FieldTap with it, a free Comrex app that lets me call in to EarShot IFB from my phone, and it has been very simple to use. I choose the IFB channel, press a button, and that’s all it takes. The audio quality has been great, and I’m planning to eventually get my whole news team set up with it. When we first installed EarShot IFB, we encountered some difficulty with the box not recognizing DTMF codes. I spoke to a Comrex rep at NAB, and he walked us through updating the software, which fixed the problem. Since then, we haven’t encountered any difficulties. One great thing about Comrex is how responsive the company is. When we’ve discussed problems, it’s been easy to get ahold of someone knowledgeable to help us find a solution. The audio quality is really good, and FieldTap is very clear and easy to use. I’m looking forward to playing with EarShot IFB even more, and getting FieldTap into the hands of more people out in the field. I think they’ll love it. Chris Meltvedt is News Operations Manager for 5 Eyewitness News on KSTP-TV.